There's nothing better than waking up in the morning and being able to work directly from home. The flip side is this - if you don't have a motivational office set-up, then how can you expect to stay motivated? 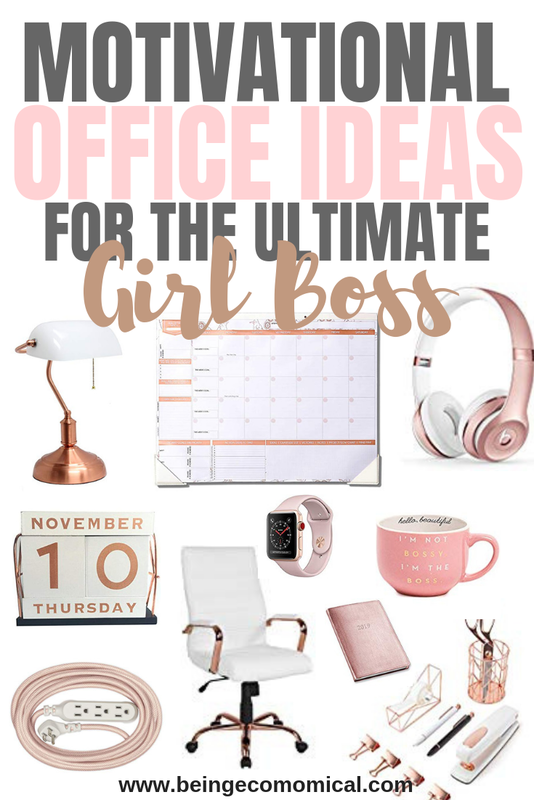 Well, here are several office decorating ideas to help you feel motivated and productive throughout your work day, along with a few must-haves that every girl boss needs to stay on top of things! Just because you work from home doesn't mean you care to listen and/or hear all of the chatter that's going on in the home around you. From personal experience, a good set of headphone is a MUST HAVE if you want to stay happy during your working hours. While this may sound simple, you may want to consider headphones with a microphone, so that you can take calls between her podcasts and inspirational playlists. With all there is to keep up with, you will definitely need a planner to start her new year off right. Go for something pretty and motivational. The more attractive the planner, the more you'll want to use it! Sitting for most of the day requires a comfortable desk chair. Treat yourself and grab a fashionable and comfortable office chair that you'll love to sit in and be motivated to do so! Long gone the days using those boring, black staplers, scissors, and pens. 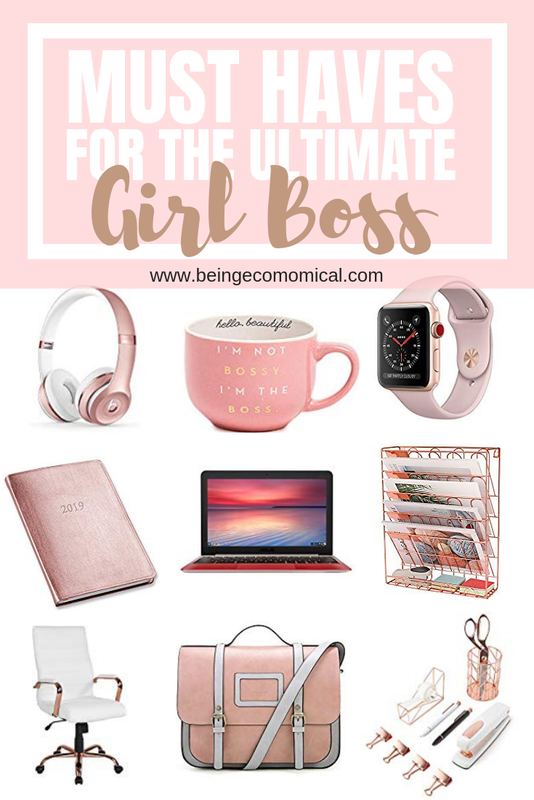 Nowadays, there are so many cute desk accessories on the market and I am certain any girl boss will love them! Being in a home office has it perks and it's also nice to be able to play around with the decor! There's nothing like some good ol' motivation during the week. Having a few motivational sayings to look at during the day will only increase your morale. Of course you want to keep up with the date and a cute wooden calendar block can turn into a fun, daily activity when changing it. Big Wall or Deskpad Calendar. Having your daily tasks laid out in front of you will help you to become more accountable and help you get even more motivated. The more you can remind yourself that it's time to work, the better! House plants in general have a number of benefits for the air quality in your home. Gifting yourself a house plant to keep in your home office will increase your productivity and your overall wellness. Having access to your contacts, your calendar, and other important apps is a really nice benefit of having a smart watch. Not having to carry your phone with you everywhere you go is also a great perk! It's also great if you take morning runs, or constantly find yourself moving around your home. There is nothing worse than not having enough outlets for your phone, your tablet, your desktop and just about anything and everything else. I've almost quit a few times, not having anymore to plug my devices! I mean, how annoying. So beat that and grab an extension cord - and it doesn't have to be boring and black, either! One of the best perks of working from home is that you can wear your pj's for as long as you like! Having a nice robe, a set of pajamas, and slippers can definitely help you ease into the day. Coffee is the staple to every work from home mom's morning, or maybe hot tea - however, I'm sure you can't get enough of a really cute mug! It's always a good idea to have several clocks around. That word accountability! It's real and it's important. Delegate your tasks accordingly and give yourself enough time to complete each task and watch how easy your day will flow. Create a cozy environment for those late nights with a cute desk lamp to ensure that things still get done. Here's the deal with Chromebooks - if you use multiple apps while working that only deal with a browser (blogging, virtual assistant,etc. ), then Chromebook may be a great option! Chromebooks allow for more storage than an average Windows computer. When using Chrome in Windows, so much space is taken up and you may end up spending thousands of dollars for a properly functioning laptop that can hold your browser's storage, photos, bookmarks, and more. After all, we are talking about working from home, so investing into a thousand dollar laptop isn't so bad, but if you are looking for a great deal - at a great price - a Chromebook may be a better option. With any functioning laptop, there is a need for a laptop bag! You may have multiple meetings on the go, or just want to change the scenery from time to time. No matter what decor you decided to go with for your home office, it's important to make sure it's a look that will motivate you to want to actually be there. That was so important for me as a work from home mom. 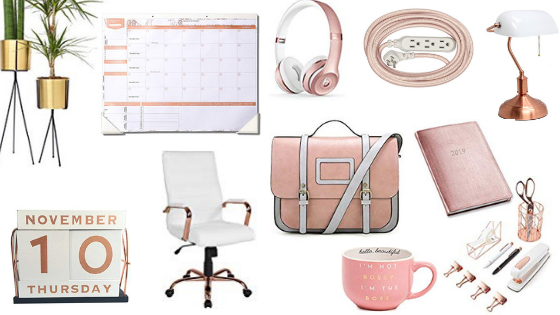 Let's face it, we'll run to anything that screams "pretty" and your office should be the same.